" Shiva and Vishnu are the same "
"sivasya hridayam vishnuh,vishnOscha hridayam shivah "
"yathA shivamayO vishnurEvam vishnumaya shivah" . 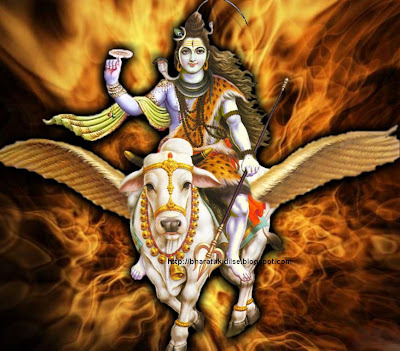 "Shiva is a form of Vishnu and Vishnu a form of Shiva. Shiva dwells in the heart of Vishnu while Vishnu in the heart of shiva." Harihara is the name of a combined deity form of both Vishnu (Hari) and Shiva (Hara) from the Hindu tradition. Also known as Shankaranarayana ("Shankara" is Shiva, and "Narayana" is Vishnu), Harihara is thus worshipped by both Vaishnavites and Shaivities as a form of the Supreme God, as well as being a figure of worship for other Hindu traditions in general. Harihara is also sometimes used as a philosophical term to denote the unity of Vishnu and Shiva as different aspects of the same Supreme God. Naarada, coming under Vishnu maaya, gives shaapam to Vishnu, Naarada says “Svaami! Please forgive Me. I, coming under influence of Your maaya, got ahankaar and did Your ninda. Please tell Me what can save Me from this ghora-paapam”. One day, when Lakshmi and Vishnu were together in vihaaram, Lakshmi sees Ucchaishravam, her brother, the horse of Revanta who is the son of Surya. Engrossed in seeing her brother, she does not reply to the repeated calls of Vishnu. Seeing her attraction, Vishnu gives her shaapam to go to Bhulokam in the form of a horse and come back to Vaikuntam only after getting a son equal to Himself! She comes to Bhuloka to experience the shaapam and realizing that none other than her brother, Shiva can help her calm Vishnu, she immediately does a tapas for Him and Shiva appears to save her soodari. Lakshmi says “You and Vishnu are both same, the Paramaatma. Please help me!”. Shiva says “Soodari! How do you know that we both are same? All learned people know that. Who told you?”. Lakshmi says, “Once Mahavishnu Himself told me this. Seeing Him in deep Daiva-dhyaanam, I asked Him “During Samudramanthanam, I thought you were the greatest of all and hence chose you. Devaadideva! Who is better than you that you are in dhyaanam of Him?”. Mahavishnu replied “I am doing Shankara-dhyaanam. He is Eshwara. He is the same as Me. All learned people know that. If someone is my devotee but still hates Shiva, he will fall into naraka”. Saying this, She asks Shiva to pursuade Vishnu to bless Her with a child. Shiva sends Chitrarupa as a duta to convince Vishnu. Vishnu immediately accepts and comes to Bhuloka and blesses Lakshmi with Ekaveera, who is equal to Vishnu Himself. The devas had looked upon the earth, and were horrified by the terrible state it was in- everywhere there was greed, war and unhappiness. Vice and sin ran rampant among people. Confused as to how things could have become like this, they approached Vishnu to seek answers. Vishnu said to them as they assembled, "Let us go to Shankar, for He is wise!" Vishnu led the demigods up the icy slopes of Mount Kailash, but saw no one there. Amidst the rocks and snow, there was no sign of Shiva or Parvati, or even Nandi. The baffled gods searched for a sign of Shiva until Vishnu came to them and said, "My beloved, your selfishness has made you blind, for Hara is here! You must purify yourselves- bathe in milk, sing the Satarudriya hymn, and take only hot milk for 3 days, and your eyes will be opened." They followed his instructions, but after 3 days they still could see no sign of Shiva. They cried out, "O Jagannath, Lord of the World, where can we find Shankar?" At that, Vishnu pointed to his chest. "He is in me, as I am in him. Can't you see that?" As he spoke, he revealed his lotus heart, and as the petals opened, the sacred Lingam could be seen in the middle. The gods fervently worshipped the lingam, bathing it in milk, covering it with vermillion and sandalpaste, offering flowers and chanting the 1008 names of Shiva. But through this, they were still disturbed- How could Hari and Hara be one and the same? Vishnu had light, Sattvic qualities, while Shiva had dark, tamasic qualities. They were so different! But knowing their thoughts, Vishnu took on the form of Shiva. The gods could no longer tell the difference between the trident-bearing, three eyed god, or the conch bearing lord. And so, realizing finally that Vishnu and Shiva were one and the same, they bowed in devotion and worshipped Sri Hari Hara. hey bro.. i hope u dont mind.. i shared ur blog link on facebook.. i am very sorry if i went against.. its just that i find ur blog to be very informational.. good job bro.. ur blog is really good..
Chinese Proverb: "When someone shares something of value with you and you benefit from it, you have a moral obligation to share it with others"
The truth is that before all gods and goddesses was ADITI Devmatar whose name is mentioned over 80 times in the Rig Veda and still nobody venerates her. (except Hijras where She has been "degraded" into Bahuchamataji). She is known as the Tao ("Tao is like a grandmother and a righteous king".."The Tao is older than GOD") in the Sacred Tao te Ching of Lao Tse...and Wu Xi ,the 'Ineffable Ultimateless' by Taoist sages. As Sitatapatra Devi among Buddhists. And is called BARBELO by the Christian Gnostics. (Read amazing sacred text "Trimorphic Protennoia" from Nag Hammadi Library). It is extremely you will ever get this information anywhere else, but SHe is guiding me to reveal this..
Only then do all the pieces of the puzzle fit together and make perfect sense��..for a while lol ( SHe is after all Incomprehensible and Unsurpassed Brahma'n). May SHe extend Her blessing to All who read this.